Product #16372 | SKU CRK-42K | 0.0 (no ratings yet) Thanks for your rating! 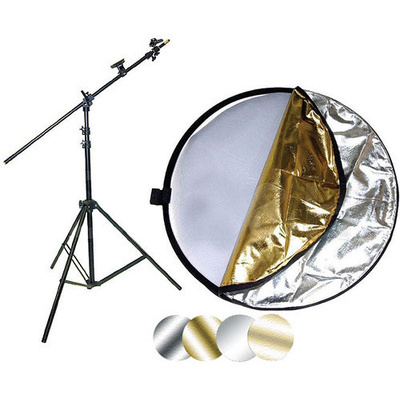 The Impact Collapsible Reflector Disc is a versatile lighting tool for in the field and in the studio. It allows you to bring out the shadow detail in your subject, using available or studio lighting. In addition, the colored surfaces allow you to modify the colour of your subject. Your choice of colour -- silver, gold, soft gold, reflective or translucent white -- will be determined by the lighting conditions, and personal preference. This 42" round disc is suitable for a 3/4 length portrait, and a medium-size still-life setup. It folds down to 1/3 its open size, and comes with a storage sleeve. Included is a pivoting arm that telescopes out of its own stand, to hold the disc where needed.